Our little Gwendolyn will always hold a special place in our hearts. She was the first goat born here on the farm. 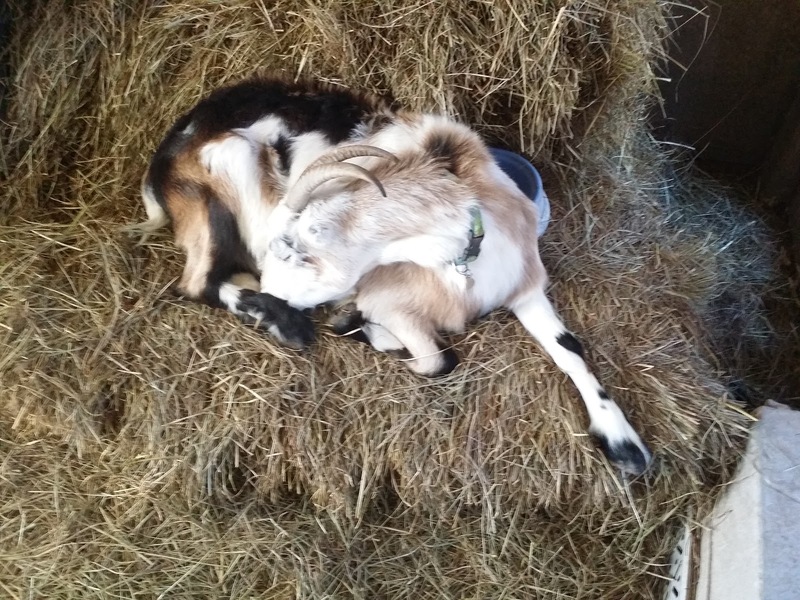 We knew her mother Josie had CAE, a nasty goat virus that is spread from mother to kid by nursing, so we made sure to be there when Gwen was born and diligently raised her on a bottle while carefully heat treating her mother's milk to kill the virus. After a few weeks, we decided to find a nanny for Gwen to act as a companion and so that Gwen could get fresh milk. We found Thea, our big Saanen doe, who would allow Gwen to nurse while on the stand and was happy to act as a companion to our growing girl. When we bought Thea, we were given every assurance that she was CAE negative so we did not test her. When we finally decided to test Thea and Gwen months later just to be sure, we were devastated to find that both does were positive with virus. In our efforts to avoid spreading the virus, we went from one goat with the disease to three. Several years later, we have learned how to deal with CAE for the most part. We test every new goat that comes on the farm, and we test all our does before they give birth. So far, we have never had another transmission here on the farm. That said, we still have to deal with our three positive girls. We are too attached to them to "cull" them as some people would suggest. Josie seems to just be a carrier with few if any symptoms. Thea has the classic arthritis developing in her front limbs. And Gwen? Well, Gwen is starting to show what we can only assume are signs of the virus. She is thin. She's very skinny, and we've had her repeatedly checked for parasites and dewormed. Now we are doing our best to manage the virus by treating our Gwenny like the princess she is. At night Gwen has her own bedroom suite. We have a small pen set up with hay, alfalfa, minerals, fresh water, and a bowl of grain every night. This gives our skinny little girl free access to all the calories she wants without her having to compete with the other goats. Being small and in poor health, the other goats tend to push her around. During the day most days we let Gwen graze in the backyard. There is lots of fresh, mostly untouched grass and a few fruit trees and shrubs that she is welcome to nibble on. Her appetite isn't the greatest these days, so there is little fear of her doing any real damage to the plants. While in the backyard, she likes to make her way into our closed in porch area to nap in the middle of the day. 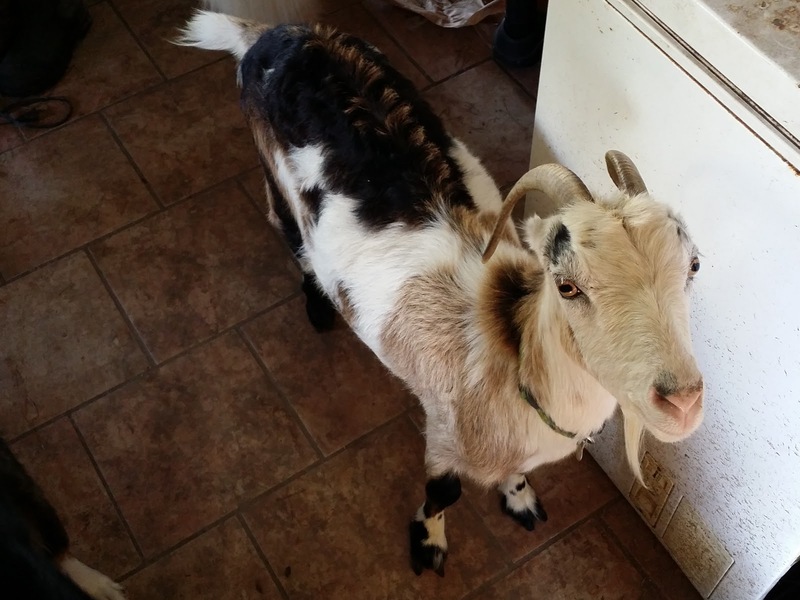 Gwen spent the first several weeks of her life living in the house, and I swear she still fancies herself an inside goat. 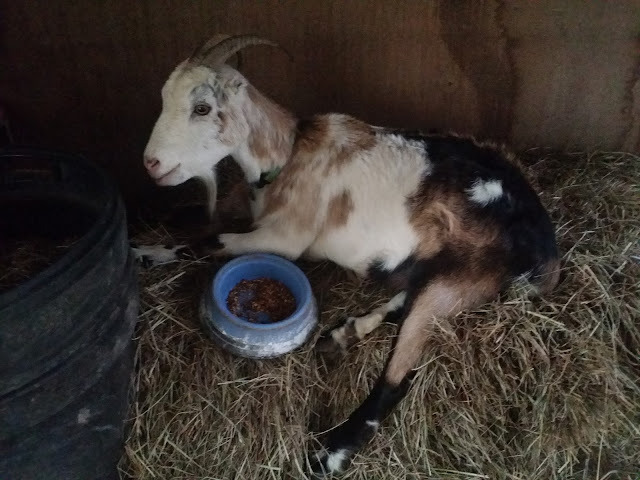 For now all our special attentions seem to be helping our princess of a goat put on a bit of weight. I suspect this winter she will need to be jacketed in the cold weather. The few chilly days we had recently seemed pretty hard on her. CAE is a terrible disease that almost always shortens the life of goats who have been infected. Hopefully all our efforts will keep our Gwenny with us at least a little bit longer. It's that time of year again. Time for turkey! This year we decided not to buy any birds from the commercial hatcheries, but to just raise birds hatched here on the farm from our breeding flock of Bourbon Reds. We had the incubator cooking all spring and summer and basically hatched out every egg our small flock produced. I couldn't tell you exactly how many little poults we produced, but we had hatchings every few weeks. We sold many of the little birds locally then at some point stopped selling them and started growing them out for Thanksgiving. We started out with at least 60 birds. Unfortunately, we had a terrible year for predators. We had the dog attack, but before and after we had hawks, possums, and foxes all wreaking havoc on our flocks. At this point we have about 30 birds that will be going off to the processors tomorrow. We really like raising the Bourbon Reds. They seem to be very hardy birds who enjoy ranging and foraging in our pastures. They are a little more standoffish than the broad breasted whites, who will mob you and knock you down for food, but friendly enough to be easy to handle and put away at night. Rialey has progressed so much in her herding training this year and does a great job of keeping the birds from being underfoot or getting too pushy with us...though she could probably stand to move them with a little less...enthusiasm. Tomorrow morning we will be loading the birds up and transporting them to the USDA processor who just so happens to be in the next town over. This makes us very happy as less travel time means less stress for the birds. At this time, we still have a few birds available if anyone local is looking to add a locally, ethically raised bird to their Thanksgiving table. Email us at orders@hightailfarms.com if you would like to get on the list! Hope everyone has a happy turkey day!